Fifty-Fifty har situation mein hissedari” Why am I remembering that song? …...under a phoolon-ki-chaadar made entirely of red and pink of roses. 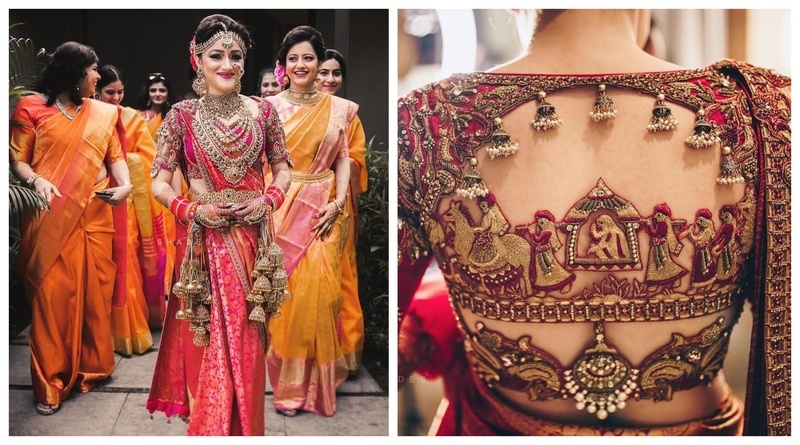 For the wedding Palak chose to wear a kanchipuram saree paired with a Doli blouse by Sakina Ahmed . Her blouse literally broke the internet! It depicts the story of a Raja & Rani. It was an inspiration taken from the Indian weddings that beautifully narrate the wedding story of a Raja and Rani and their Bharath. She completed her look with a heavy choker and earring set paired with layered necklaces, a statement matha-patti, kamar bandh, haath phool and the choodas. What grabbed my attention the most were her unique kaleeres! The mandap decor consisted of a thousand roses encapsulating the timeless treasure of love in their petals, for the couple's most memorable day. The bells sang the song of marriage as the flowers spread the scent of love. This decor by Atisuto was just phenomenal. Palak chose to wear an all-yellow outfit for her mehendi brunch paired with an pink and white floral jewellry. They chose to have a tropical brunch by the beach and the decor was needless to say tasteful. In the evening Palak wore an orangish yellow lehenga with pearl details and Dhruv complimented her look with a peach asymmetrical kurta paired with a magenta bandh gala. For the her cocktail night, palak chose to wear very feminine peach gown and looked her most stunning self. Dhruv on the other hand wore an all-white suit paired with a tropical print sea-green shirts paired with white loafers. Venue - The Leela, Goa.